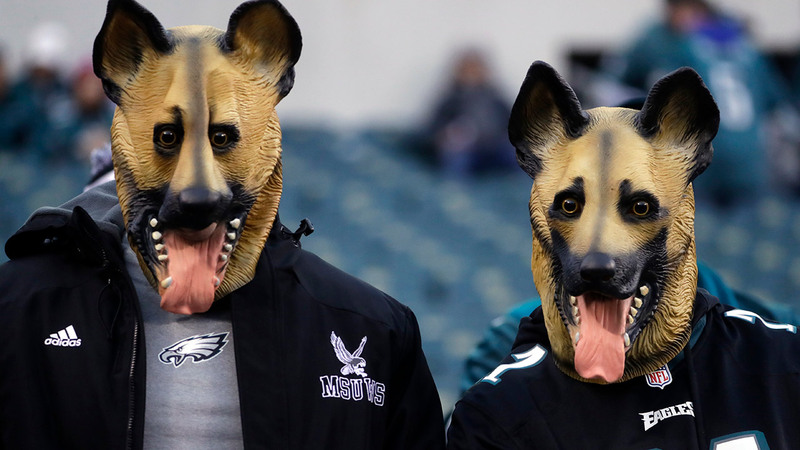 Philadelphia Eagles fans dressed as underdogs watch as players start to warm up before the NFL football NFC championship game against the Minnesota Vikings Sunday, Jan. 21, 2018. The Westgate SuperBook in Las Vegas on Sunday installed the Eagles as 5.5-point underdogs to the New England Patriotsfor Super Bowl LII. William Hill's Nevada book went a touch lower, with New England opening as a 5-point favorite. The Super Bowl over/under was set at 47.5. The Patriots will be looking for their second straight Super Bowl title and third in the past four seasons, when they take on the Eagles on Feb. 4, at U.S. Bank Stadium in Minneapolis. Philadelphia is the largest Super Bowl underdog since the Arizona Cardinals were seven-point underdogs to the Pittsburgh Steelers in Super Bowl XLIII. Since Nevada Gaming Control began tracking wagering on the Super Bowl in 1991, the state's regulated sportsbooks have come out ahead in 25 of 27 games. The books are up a net $173.6 million on the Super Bowl during that span, with their only two losses coming in 2008 (Patriots-New York Giants) and 1995 (San Francisco 49ers-San Diego Chargers). Malcolm Jenkins tells Sal Paolantonio that the Eagles had confidence since the first snap and says that no matter who is on the other side of the field the Eagles are "destined" to win Super Bowl LII.